For those of a similar name, see John Milner (disambiguation). 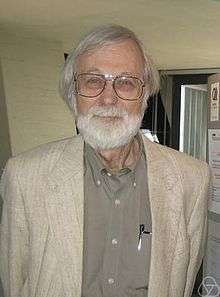 John Willard Milnor (born February 20, 1931) is an American mathematician known for his work in differential topology, K-theory and dynamical systems. Milnor is a distinguished professor at Stony Brook University and one of the four mathematicians to have won the Fields Medal, the Wolf Prize, and the Abel Prize (along with Pierre Deligne, Jean-Pierre Serre, and John G. Thompson). Milnor was born on February 20, 1931 in Orange, New Jersey. His father was J. Willard Milnor and his mother was Emily Cox Milnor. As an undergraduate at Princeton University he was named a Putnam Fellow in 1949 and 1950 and also proved the Fary–Milnor theorem. He continued on to graduate school at Princeton under the direction of Ralph Fox and submitted his dissertation, entitled "Isotopy of Links", which concerned link groups (a generalization of the classical knot group) and their associated link structure, in 1954. Upon completing his doctorate he went on to work at Princeton. He was a professor at the Institute for Advanced Study from 1970 to 1990. His students have included Tadatoshi Akiba, Jon Folkman, John Mather, Laurent C. Siebenmann, and Michael Spivak. His wife, Dusa McDuff, is a professor of mathematics at Barnard College. One of his published works is his proof in 1956 of the existence of 7-dimensional spheres with nonstandard differential structure. Later, with Michel Kervaire, he showed that the 7-sphere has 15 differentiable structures (28 if one considers orientation). An n-sphere with nonstandard differential structure is called an exotic sphere, a term coined by Milnor. Egbert Brieskorn found simple algebraic equations for 28 complex hypersurfaces in complex 5-space such that their intersection with a small sphere of dimension 9 around a singular point is diffeomorphic to these exotic spheres. Subsequently Milnor worked on the topology of isolated singular points of complex hypersurfaces in general, developing the theory of the Milnor fibration whose fiber has the homotopy type of a bouquet of μ spheres where μ is known as the Milnor number. Milnor's 1968 book on his theory inspired the growth of a huge and rich research area which continues to mature to this day. In 1961 Milnor disproved the Hauptvermutung by illustrating two simplicial complexes which are homeomorphic but combinatorially distinct. In 1984 Milnor introduced a definition of attractor . The objects generalize standard attractors, include so-called unstable attractors and are now known as Milnor attractors. It is evident now that low-dimensional dynamics, to a large extent initiated by Milnor's work, is a fundamental part of general dynamical systems theory. Milnor cast his eye on dynamical systems theory in the mid-1970s. By that time the Smale program in dynamics had been completed. Milnor's approach was to start over from the very beginning, looking at the simplest nontrivial families of maps. The first choice, one-dimensional dynamics, became the subject of his joint paper with Thurston. Even the case of a unimodal map, that is, one with a single critical point, turns out to be extremely rich. This work may be compared with Poincaré's work on circle diffeomorphisms, which 100 years before had inaugurated the qualitative theory of dynamical systems. Milnor's work has opened several new directions in this field, and has given us many basic concepts, challenging problems and nice theorems. He was an editor of the Annals of Mathematics for a number of years after 1962. He has written a number of books. In 1962 Milnor was awarded the Fields Medal for his work in differential topology. He later went on to win the National Medal of Science (1967), the Lester R. Ford Award in 1970 and again in 1984, the Leroy P Steele Prize for "Seminal Contribution to Research" (1982), the Wolf Prize in Mathematics (1989), the Leroy P Steele Prize for Mathematical Exposition (2004), and the Leroy P Steele Prize for Lifetime Achievement (2011) "...for a paper of fundamental and lasting importance, On manifolds homeomorphic to the 7-sphere, Annals of Mathematics 64 (1956), 399–405". In 1991 a symposium was held at Stony Brook University in celebration of his 60th birthday. Milnor was awarded the 2011 Abel Prize, for his "pioneering discoveries in topology, geometry and algebra." Reacting to the award, Milnor told the New Scientist "It feels very good," adding that "[o]ne is always surprised by a call at 6 o'clock in the morning." In 2013 he became a fellow of the American Mathematical Society, for "contributions to differential topology, geometric topology, algebraic topology, algebra, and dynamical systems". —— (1965). Lectures on the h-cobordism theorem. Notes by L. Siebenmann and J. Sondow. Princeton, NJ: Princeton University Press. ISBN 0-691-07996-X. OCLC 58324. —— (1968). Singular points of complex hypersurfaces. Annals of Mathematics Studies, No. 61. Princeton, NJ: Princeton University Press; Tokyo: University of Tokyo Press. ISBN 0-691-08065-8. —— (1971). Introduction to algebraic K-theory. Annals of Mathematics Studies, No. 72. Princeton, NJ: Princeton University Press. ISBN 978-0-691-08101-4. Husemoller, Dale; Milnor, John W. (1973). Symmetric bilinear forms. New York, NY: Springer-Verlag. ISBN 978-0-387-06009-5. Milnor, John W. (1997) . Topology from the differentiable viewpoint. Princeton Landmarks in Mathematics. Princeton, NJ: Princeton University Press. ISBN 0-691-04833-9. Milnor, John W. (1956). "On manifolds homeomorphic to the 7-sphere". Annals of Mathematics. Princeton University Press. 64 (2): 399–405. doi:10.2307/1969983. JSTOR 1969983. MR 0082103. —— (1959). "Sommes de variétés différentiables et structures différentiables des sphères". Bulletin de la Société Mathématique de France. Société Mathématique de France. 87: 439–444. MR 0117744. —— (1959b). "Differentiable structures on spheres". American Journal of Mathematics. Johns Hopkins University Press. 81 (4): 962–972. doi:10.2307/2372998. JSTOR 2372998. MR 0110107. —— (1961). "Two complexes which are homeomorphic but combinatorially distinct". Annals of Mathematics. Princeton University Press. 74 (2): 575–590. doi:10.2307/1970299. JSTOR 1970299. MR 133127. —— (1984). "On the concept of attractor". Communications in Mathematical Physics. Springer Press. 99 (2): 177–195. doi:10.1007/BF01212280. MR 0790735. Kervaire, Michel A.; Milnor, John W. (1963). "Groups of homotopy spheres: I" (PDF). Annals of Mathematics. Princeton University Press. 77 (3): 504–537. doi:10.2307/1970128. JSTOR 1970128. MR 0148075. ↑ Staff. A COMMUNITY OF SCHOLARS: The Institute for Advanced Study Faculty and Members 1930–1980, p. 35. Institute for Advanced Study, 1980. Accessed November 24, 2015. "Milnor, John Willard M, Topology Born 1931 Orange, NJ." ↑ Helge Holden; Ragni Piene (3 February 2014). The Abel Prize 2008–2012. Springer Berlin Heidelberg. pp. 353–360. ISBN 978-3-642-39448-5. ↑ Allen G. Debus (1968). World Who's who in Science: A Biographical Dictionary of Notable Scientists from Antiquity to the Present. Marquis-Who's Who. p. 1187. ↑ Milnor, John (1969). "A problem in cartography". Amer. Math. Monthly. 76: 1101–1112. doi:10.2307/2317182. ↑ Milnor, John (1983). "On the geometry of the Kepler problem". Amer. Math. Monthly. 90: 353–365. doi:10.2307/2975570. ↑ O'Connor, J J; EF Robertson. "John Willard Milnor". ↑ Abelprisen (Abel Prize) website. "The Abel Prize awarded to John Milnor, Stony Brook University, NY". Archived from the original on April 29, 2011. Retrieved March 24, 2011. ↑ Ramachandran, R. (March 24, 2011). "Abel Prize awarded to John Willard Milnor". The Hindu. Retrieved 24 March 2011. ↑ Aron, Jacob (March 23, 2011). "Exotic sphere discoverer wins mathematical 'Nobel'". New Scientist. Retrieved 24 March 2011. ↑ 2014 Class of the Fellows of the AMS, American Mathematical Society, retrieved 2013-11-04. ↑ Kuiper, N. H. (1965). "Review: Morse theory, by John Milnor". Bull. Amer. Math. Soc. 71 (1): 136–137. doi:10.1090/s0002-9904-1965-11251-4. ↑ Spanier, E. H. (1975). "Review: Characteristic classes, by John Milnor and James D. Stasheff". Bull. Amer. Math. Soc. 81 (5): 862–866. doi:10.1090/s0002-9904-1975-13864-x. ↑ Hubbard, John (2001). "Review: Dynamics in one complex variable, by John Milnor". Bull. Amer. Math. Soc. (N.S.). 38 (4): 495–498. doi:10.1090/s0273-0979-01-00918-1. O'Connor, John J.; Robertson, Edmund F., "John Milnor", MacTutor History of Mathematics archive, University of St Andrews . Raussen, Martin; Skau, Christian (March 2012). "Interview with John Milnor" (PDF). Notices of the American Mathematical Society. 59 (3): 400–408. doi:10.1090/noti803.